A bill repealing the authority to use speed cameras and red light cameras (House Bill 536) is scheduled for a hearing on February 23rd in the the House Environment and Transportation Committee. Warren miller, Christopher Adams, Steven Arentz Jerry Clark, Mark Fisher, William Folden, Robin Grammer, Kevin Hornberger, Seth Howard, Susan Krebs, Susan Mccomas, Tony Mcconkey, Matt Morgan, Charles Otto, April Rose, Sid Saab, and Haven Shoemaker. These lawmakers are the ones who want to REPEAL speed cameras. House Bill 536 would ban both speed cameras and red light cameras. Speed cameras have been particularly criticized since 2012 when it was discovered that Baltimore City has erroneously cited thousands of innocent motorists for speeding. The city's own audit found that as many as 10% of all citations were due to errors, meaning 1 in 10 motorists cited were actually innocent of what they were accused of. Cases included documented examples of "speeding" vehicles that were not even moving, and large trucks falsely cited for traveling twice their actual speed. Local governments and speed camera contractors had previously lied, telling the public that their equipment could not be wrong because it was "tested and calibrated", and that "if you don't speed you won't get a ticket", even though speed camera vendor Xerox later needed to acknowledge that even properly calibrated equipment could be subject to what they called "radar effects". Similar errors have been reported elsewhere in the state, including in College Park, Brentwood, New Carrollton, Forest Heights, Cheverly, and Montgomery County. In other cases, in 2010 Montgomery County was caught systematically failing to perform required calibration tests on many days citations were issued, affecting many thousands of citations. Montgomery County refused to refund any of those citations. A promised review of this practice by the program's so called ombudsman was never provided. By design, speed and red light cameras are issued to the owner rather than the driver of the vehicle. This means that it is literally possible for someone to be found guilty in court even though there is no evidence that the person committed the violation, something which absolutely does happen even in many cases where there is evidence the person was NOT driving. Legislation passed in 2014 failed to solve many such problems. Just in the last year, we discovered that the City of Rockville had falsely accused the county's own school bus of speeding... a complaint only taken seriously because it was a county flagged vehicle that was falsely accused. Records retrieve from Rockville showed other cases where cameras had fired showing "no progression". In one a recent case, the city of College Park erroneously issued hundreds of citations from a speed camera which was configured to enforce the wrong speed limit. In another recent case, Baltimore County issued a speed camera citation to a STATIONARY vehicle. Even after the ticket recipient contacted the so called "ombudsman" for the program directly, . 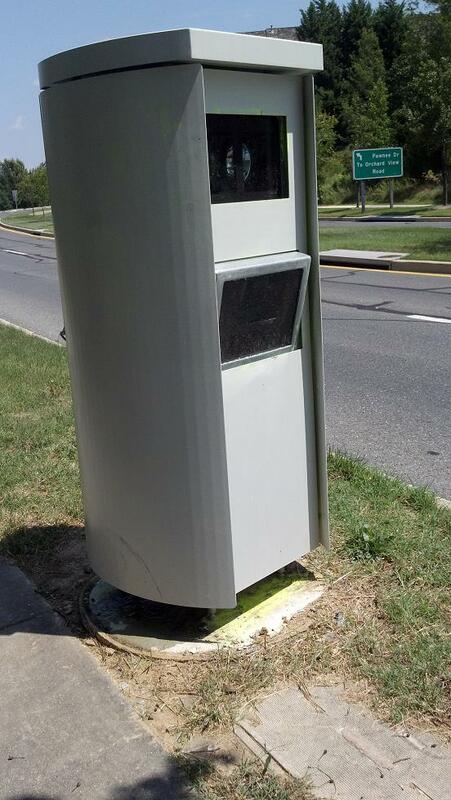 Baltimore County has acknowledged to us that they are currently using the same model of speed camera which previously produced erroneous citations in Baltimore City, despite this history of errors. They furthermore admitted that they have no review procedures in place for identifying speed measurement errors. In Montgomery County, the District court hold only a single day to hear all speed camera cases, often piling 50, 60 or more cases. In one documented example, a district court judge flew threw a "rocket docket" of 60 cases in only one hour, finding every single person guilty except a few police officers whom the judge gave a pass for speeding. Defendants in those hearings are PRESUMED GUILTY. All evidence the prosecution presents is accepted with no authentication, something normally required for court evidence, whereas defendants often have their evidence tossed out as "hearsay", creating an entirely imbalanced proceeding in which it is almost impossible for defendants to prevail regardless of their innocence. The concepts of "presumed innocent" and "beyond reasonable doubt" totally DO NOT EXIST in this proceeding. "Speed Camera Day" Judges almost never accept any evidence or argument that equipment could have been incorrect, even though NUMEROUS examples of erroneous speed readings by speed cameras have been documented judges simply accept as given that the speed measurement cannot be wrong. Some judges have openly stated that they only defense they will accept is evidence that a car was stolen, and even in those cases the burden of proof is on the vehicle owner. Defendant found guilty are charged court costs... paid into the District Court's budget ONLY for finding defendants guilty, meaning the court has a direct financial incentive to find as many defendants guilty as quickly as possible. In the case of red light cameras, Montgomery County was recently found using yellow lights shorter than standards set by the SHA. Short yellow lights can greatly increase the number of red light violations. Montgomery County refused to refund any citations after this was discovered, and has opposed efforts by the Maryland Drivers Alliance to obtain public records showing exactly how many violations this might have cause. This is completely consistent with Montgomery County's culture of secrecy surrounding their speed camera program. In order for the speed camera repeal legislation to get a vote in the House, HB536 must pass the Environment and Transportation Committee... a legislative body which is largely dominated by jurisdictions which profit from speed cameras. Tell the Members of the Environment and Transportation Committee to REPEAL speed cameras. Tell them you want them to give House Bill 536 a FAVORABLE VOTE. Tell these lawmakers that speed cameras represent a TRAVESTY OF JUSTICE. Tell them that if they truly support speed cameras, they should attend a Montgomery County "speed camera day" hearing in person and see for themselves the "meat-grinder justice" which the Maryland State Legislature has created. Tell them that the concerns about speed cameras have NOT been solved. You can also find your own state lawmakers here. Tell them that they should oppose ANY expansion of photo enforcement, including Montgomery County's SNEAKY BACK DOOR PLAN to expand speed cameras BY GREATLY REDUCING SPEED LIMITS.